Gum disease, which is technically referred to as “periodontal disease,” matures when both the tissues and bones that surround and support the teeth become infected. It can range from a mild inflammation (gingivitis) to a serious disease (periodontitis). 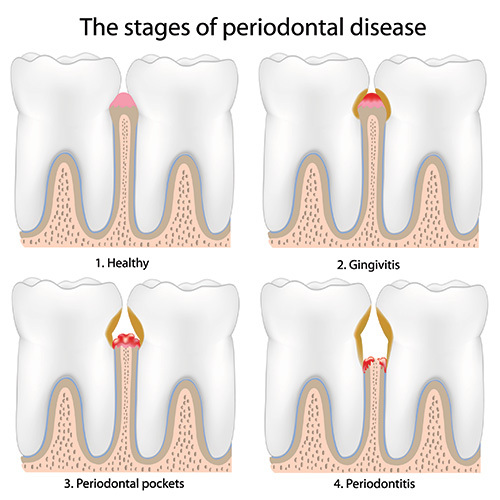 The two types of gum disease “gingivitis and periodontitis” can also be regarded as two degrees of gum disease. This is because if gingivitis goes untreated, it may possibly advance to periodontitis. Gingivitis develops when bacteria in plaque builds up, causing the gums to become red and swollen, into an inflamed state. During this stage, the gums also easily bleed during brushing. If you currently suffer from this, it is important to schedule a dental visit. If you ignore these problems, your gingivitis can get worse. Periodontitis is much more serious. With this disease, the inner layer of the gum and bone actually pull away from the teeth and form pockets. These pockets, or small spaces, will then collect debris and become infected. Eventually the toxins, or poisons, break down the bone as well as the connective tissue that secure the teeth in place. Tooth loss will eventually occur as periodontitis progresses, because the pockets will have deepened and the gum tissue and bone will be destroyed. This severe type of gum disease will also cause persistent bad breath, pus seeping through the gums, and possible teeth misalignment. *Tobacco users are at a higher risk of gum disease. If your parents or their parents had periodontitis, this does not mean that you will get it as severely. But there is an increased risk status to those who are genetically susceptible to developing gum disease. Poor oral hygiene is the primary cause of gum disease; therefore, it is important that you visit the dentist regularly and be aware of the tendency you have to get gum disease, especially if your parents lost all or most of their teeth. What to Do After Gum Disease Has Been Diagnosed? Unfortunately, once you have periodontal disease, you will always have it â€“ there is no cure. However, it can be maintained so that it does not progress to the point of tooth loss. It is important that you continue to go in for regular checkups and teeth cleaning. You may need to do this more than twice a year, which is typically how often a person in good oral health should go in. Professional cleaning will help to remove all of the plaque and tarter that you missed during your brushing and flossing. Depending on the degree of gum disease you have, Inland Empire dentist Dr. Naik may prescribe antibiotics to help stave off the infection. The antibiotics could be topical (can be applied directly on the gums), in a pill or capsule form, or a type of mouthwash. You may also be instructed to use a special antibacterial toothpaste that is designed to reduce plaque and gingivitis. If the gum disease is in its advanced stage – periodontitis – then surgical treatment may be necessary. This can, however, result in regeneration of some or all of the lost gum and bone. Periodontal treatment is intended to prevent gum disease from permanently damaging tissues, control infection, and causing tooth loss. By brushing twice a day and flossing at least once a day, visiting the dentist for regular check-ups and cleanings, and avoiding all tobacco use (can interfere with healing), you are helping to prevent further damage to the surrounding gums and tissues. What is the Best Way to Prevent Gum Disease? Keeping your mouth plaque-free is the best way to prevent gum disease. It is true, there are many factors that can contribute to gum disease; however, plaque build-up remains the number one cause of the disease. Good oral hygiene, which includes regularly brushing two times a day and flossing once on a daily basis, will help to prevent plaque from forming.